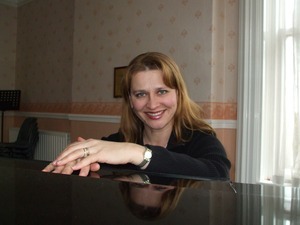 Elena has been teaching piano at the Ulster College of Music since 1999, and maintains an enthusiastic student base within the College. She is educated to the highest level, having attained her Masters Degree in Music at the Moscow Conservatoire and having undertaken further study at the Bach Academy in Stuttgart. A skilled performer and conductor, Elena’s extensive experience includes being employed by the prestigious Novodevichy Cathedral Choir in Moscow as Assistant Conductor (1990-1999), performance work at the A. Vasiliev Drama Theatre in Moscow and Music Directorship of the V. Mayakovsky Academy Drama Theatre between 1995 and 1999. Proir to teaching at the UCM, Elena taught at the Music School in Moscow for 8 years, further honing her ability to convey musical ideas. The width of Elena’s professional experience allows her to effectively improve student performances and technique whilst educating them within a broader awareness of musical traditions. Whilst at the Ulster College of Music, Elena continues to promote excellence in performance and enjoyment of music with her students, and organises performance opportunities where possible. Ever the approachable and intuitive teacher, her students continue to develop their skills and passion for the piano in an encouraging and welcoming environment.